Posted June 2, 2018 . Filed under Alumni, CMC News, Extra-curricular, Industry, Public engagement, Staff. This year’s student dissertation conference was chaired by Dr Jill Nash. 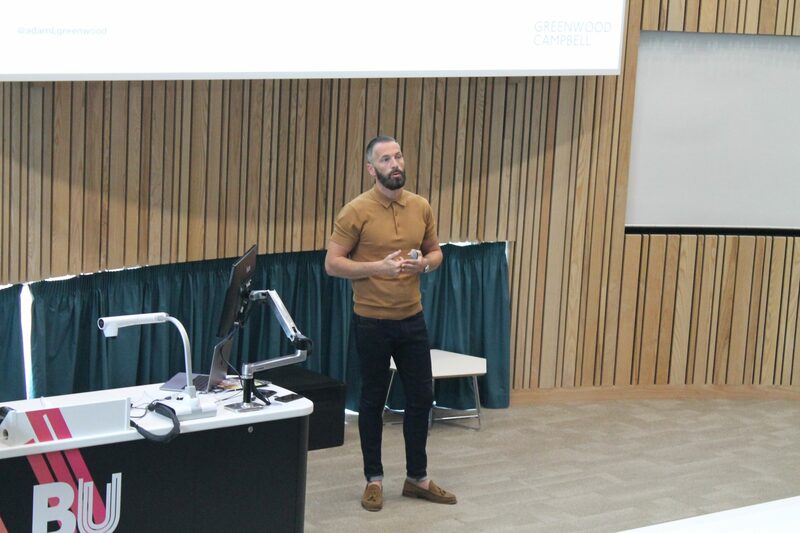 The event was opened by a key note from Adam Greenwood, the CEO of Greenwood Campbell, a technology-focused creative agency based in Bournemouth. Adam’s inspiring and, given the profile of his business, futuristic opening key note, provoked some thinking early in the morning – his key arguments focused on artificial intelligence (AI), brands as technological creations, as well as the pros and cons of artificial intelligence in people’s everyday life. In a short interview after his keynote, Adam shared insights about the developments in corporate communications, and argued that the future of marketing communications lies at the intersection of AI, technological solutions such as Google Glass, and voice operated hardware (e.g. Google Home or Alexa), which will get increasingly sophisticated. The speed of technological changes will, according to Adam, be so fast that students will have to take a greater responsibility for commercial and technological education. For him, reading, involvement in placements, and pro-active search for professional inspirations at events and conferences is the only way, in which corporate communication students can find their way forward in this new brave world. Adam’s keynote nicely set the tone for the day. Subsequently, in all panels, CMC’s UG students had an opportunity to share the findings of their projects. The presentation topics focused on themes ranging from cultural intelligence and social media usage, to ethics of influencers marketing in video gaming, to gruesome images of war in Western media. As well as presenting their work, students did a great job discussing and defending arguments put forward. 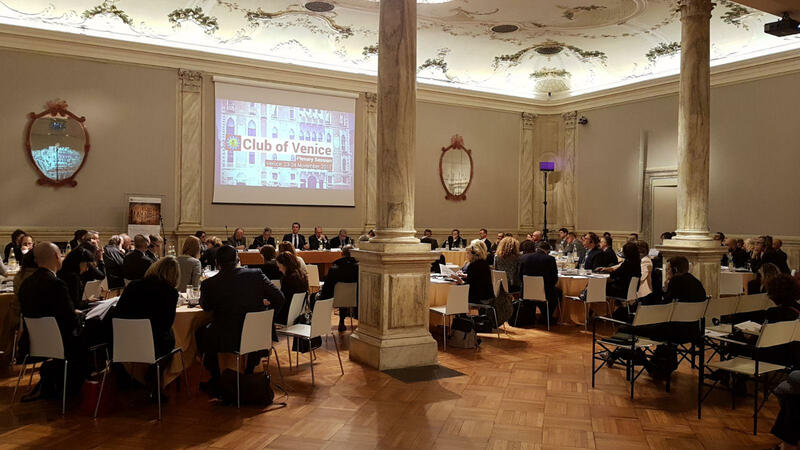 The conference presentations were accompanied by a lively discussion during the launch and coffee breaks. 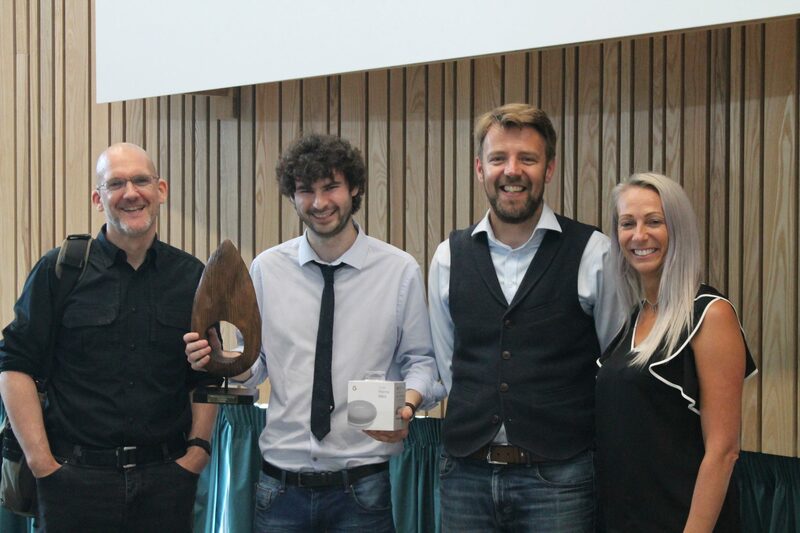 The intellectual efforts of all students were recognised with the best presentation award, which this year went to Dominic Stephens of BA (Hons) Public Relations for his work on the politicisation of late night talks shows. The award for the presentation of a day was sponsored by Greenwood Campbell. The presented dissertations of seven students is going to be recognised with an opportunity (or perhaps privilege, depending on ones’ epistemological stance) to publish with their supervisors in the ‘Journal of Promotional Communications’. The closing remarks by Dr Richard Scullion, not only offered the imagination-capturing summary of the conference, but also the demonstration of how to whole-heartedly embrace AI technology, and to be “one step-ahead-of-the-future”. Students, lovely parents and friends such as Liam Toms, who simply can’t get enough of CMC, enjoyed the conference, as it was well put together thanks to organisational skills of Dr Chris Miles and Dr Jill Nash. Dr Pawel Surowiec and Dr Andrew Kear were conference co-organisers. Posted March 19, 2018 . Filed under CMC News. BU hosts international conference on the state of the world, fifty years after it was turned inside out (circa 1967) and upside down (circa 1968). Posted March 11, 2018 . Filed under CMC News. Dr. Chris Arnold (the recipient of an honorary doctorate from BU) gave a Masterclass in “fuzzy thinking” to the students of MA Advertising on 07 March to assist them in finding innovative ways in which to approach creative challenges. Chris also led the students through an exercise based on a live brief on behalf of a major global brand (for GP Batteries) — a client for his two agencies, Creative Orchestra and The Garage. Posted February 27, 2018 . Filed under CMC News. 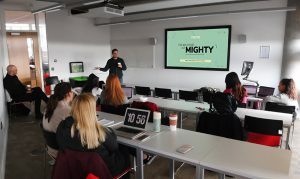 On Tuesday 27 February, the students in MA Advertising were given a workshop by Sean Parkin, Head of Creative at London advertising agency FKC. Sean is a regular contributor to the MA Creative Direction unit. * the design of an image to illustrate the proposition and convey the identified benefit to the TA. Sean was so impressed by one of the ideas proposed by the students (congratulations to Marie Neoralova and Amy Rivers) that their idea may make its way into the campaign. Posted December 12, 2017 . Filed under CMC News. 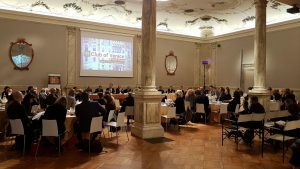 The debate about the proliferation of fake news and disinformation campaigns launched towards European democracies from Russia is gaining momentum as the European Union and the North Atlantic Treaty Organisation are gearing their efforts to challenge both fake news and disinformation campaigns. Upon the invitation from the EU and the NATO, Dr. Pawel Surowiec, of the Faculty of Media and Communication, addressed the audiences of both inst itutions, and spoke at events concerning challenges to strategic communication brought about by fake news and disinformation campaigns. On 7 December, 2017, at the conference entitled ‘Myth and Reality: Countering Disinformation in Visegrad 4’ (Warsaw), the Faculty’s researcher participated in a panel discussion focusing on solutions to the disinformation campaigns, and offered an expert intervention on hybridisation of soft power and strategic communication during the conference held on 23-24 November, 2017 at the Annual Plenary, Club of Venice – the European Council’s network of strategic communicators. 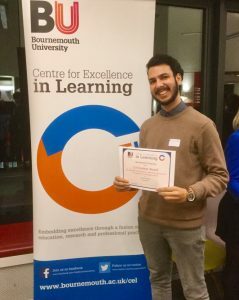 Connor Peters, final year BA (Hon) Public Relations student, receives a co-creation award hosted by Centre for Excellence in Learning at a ceremony on December 5, 2017. During Connor Peters’ placement year, he gained insight into challenges amongst public relations specialists in the technology industry when utilizing social media. Having done much content creation and social media planning himself and realizing that he wanted a deeper understanding of how it’s used in a global context, he decided to apply for the Bournemouth University co-creation project. The project hosted by the Centre for Excellence in Learning (CEL) gives final year students the chance to put together a research proposal and work with an academic with the end goal of a joint publication. On December 5, Connor received the co-creation award and a £500 check presented by the Deputy Vice-Chancellor Professor Tim MacIntyre-Bhatty. The Deputy Vice-Chancellor iterated that the opportunity for students and staff to work on project to create knowledge is a great opportunity to make a positive impact locally and nationally. To learn more about co-creation projects, visit the CEL blog https://microsites.bournemouth.ac.uk/cel/. Posted December 8, 2017 . Filed under CMC News. The Department of Corporate and Marketing Communication’s work for Cog Research and Exterion Media was recognised last night with the project winning Best Media Research at the Market Research Society of Great Britain’s annual awards function. The team comprised academics from our PR, Marketing Communications and Advertising degree programmes. You can find out more about the project here. Posted November 27, 2017 . Filed under CMC News. Posted November 8, 2017 . Filed under CMC News. The students of MA Advertising visited local ad agency Bright Blue Day. Managing Director Jonathan Clark and Bright Blue Day are longstanding supporters of BU — and have previously provided rewarding placements for the students of both the BA and MA advertising programmes. 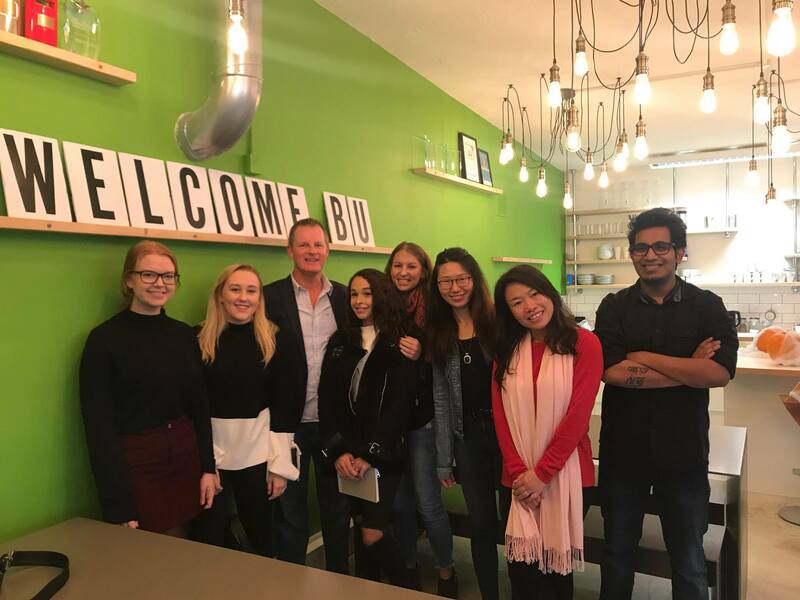 The students of the 2017-18 cohort of MA Advertising programme (L-R: Olivia Pepper, Amy Rivers, Aaliyah Binnie-Martins, Marie Neoralova, Ya-Hsiu Chang, Lianhua Li and Harshwardhan Munje) were welcomed to a visit to local Bournemouth advertising agency Bright Blue Day by Managing Director Jonathan Clark (3rd from left).